The River District is one of the few sections of Phlan that lie in the mainland. It is linked to the Old City by the bridge of Umheer and it is the most apparent display of the ongoing reclaiming effort by the citizens of Phlan. This district, while mostly rebuilt and pacified by the Church of Bane, has recently been utterly devastated by an attack on the city by Melvaunt, a counteracttack by Zhentil Keep and then of an ogre army led by one of the long-lost Tharkul of the Thar. The rebuilding efforts are just about to finish and are quite impressive, including several pretty parks and landmark houses of the more affluent. The most important landmark in the area is the majestic and foreboding temple of Bane, the Dreadlord's Throne, which is in the process of being put back into business by a huge number of men that work day and night perched on the scaffolding that covers the building almost in its entirety. The population of the district is mostly workers and tradesmen at the moment. The most remarkable change that occurred to the River District in the past year is that its exclusive faithfulness to Bane is no more. It is allowed to anyone now to settle there, except the land directly around the Dreadlord's Throne cathedral, called the Hill of the Faithful. 1. The Velvet Doublet, a high-class festhall, was ruined in the invasion and it is expected to re-open in the Spring. Known as much more than a bawdy-house, it regularly hosted skilled musical performances and was known for having its own private, socially-exclusive baths. 2. The Everburning Pit (and pool). 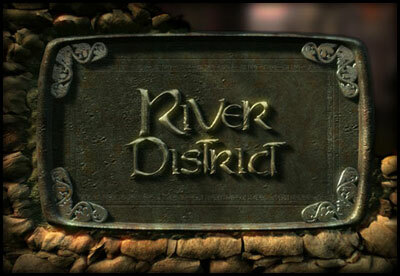 The Banite architects worked hand in hand with local druidic and wizarding help to improve the atmosphere of the River District significantly. At the moment more of an open secret than an institution, there is now a heated pool drawing directly from the heat of the Ever-Burning Pit, allowing those bold enough to enjoy a warm soak no matter what the season. The Pit itself seems harmless enough, but every month some weird rumor pops up suggesting that it’s as bad underneath as Kuto’s Well (or worse). 3. The Grove. The architect and city-planner designing the River District was careful to be certain that as many flowering plants and fruit trees were grown in the River District as possible, and tucked away, carefully-hidden in plain view is a (very) small druid’s grove. While essentially no more than the space between two trees, it has nonetheless been consecrated and is visited semi-regularly by at least one of the druids helping out with the original planting. 4. The Midden Gate. Currently being rebuilt, the eastern gate of the District overlooks the Midden Heap, where Phlanites used to discard anything they didn’t want to deal with. The Heap has a vile reputation as home to all manner of filth, disease, and foul mutations. Though sometimes visited, the little shack next to the Heap is considered a no-man’s land, as nearby lizardmen sometimes stop in to poke around or the occasional badly-mutated and unusually-bitey goblin shows up.